Femoral neck fracture has an annual incidence of 1 per 1000 population; in young patients, functional prognosis is not good due to risk of osteonecrosis. Femoral head vascularity is mostly contributed by retinacular vessels and lateral epiphyseal artery. The vascular impact is due to displacement, interrupting retinacular vessel, interrupting ligament teres vascularization, and increased intracapsular pressure, producing a tamponade effect leading to osteonecrosis. This study reviewed the different methods of assessment of femoral head vascularity after femoral neck fractures. There are many techniques for the assessment of residual femoral head vascularity after femoral neck fractures and for the assessment of post-traumatic osteonecrosis risk. Some invasive techniques are superselective angiography, intraosseous oxygen pressure measurement, or Doppler-laser hemodynamic measurement; others are noninvasive scintigraphy and conventional or dynamic magnetic resonance imaging (MRI). The future seems to lie with dynamic MRI, which gives new classification of femoral neck fractures, based on a noninvasive assessment of femoral head vascularity. Femoral neck fractures have an annual incidence of 1 per 1000 population; in the elderly, femoral neck fracture may lead to serious life-threatening conditions, and in young adults, it has poor prognosis. The risk of post-traumatic osteonecrosis is 10%–30%. The vascular impact is due to displacement, interrupting retinacular vessel, interrupting ligament teres vascularization, and increased intracapsular pressure, producing a tamponade effect., In elderly patients, this is life-threatening, with a mortality rate of 20%–30% in the year following the fracture; hence, treatment aims rapid restoration of ambulation. In young adults, treatment aims rapid restoration of anatomy by timely fixation of fracture, but still there are high chances of avascular necrosis of femoral head. This study reviewed the different options for the assessment of residual vascularity of femoral head after femoral neck fractures so that the risk of post-traumatic necrosis can be estimated. Vascularity of the femoral head is disturbed by femoral neck fracture because the epiphysis and most of the neck is intracapsular. According to the anatomic study by Trueta and Harrison, the important vascular elements of the femoral head are the retinacular vessels originating from the medial circumflex artery; the intraosseous cervical vessels play a minor role. The lateral circumflex artery comprises of fewer anterior retinacular vessels and supplies a lesser part of femoral head and so has little impact. 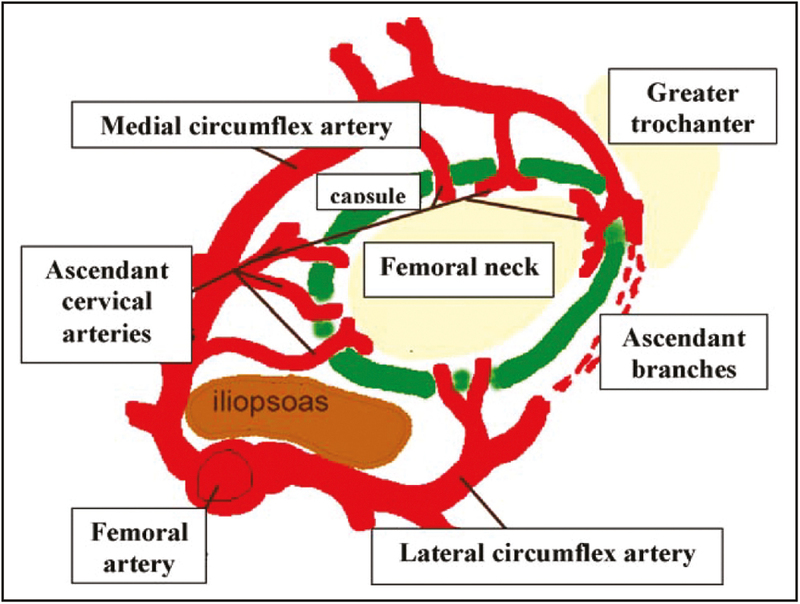 The main extraosseous arteries are the retinacular arteries deriving from the medial circumflex artery, which in turn is usually a branch of the deep femoral artery. The medial circumflex artery is extracapsular; its branches penetrate the capsule and form the inferior, posterior, and superior retinacular vessels. Retinacular vessels lie medially to the femoral head and mainly comprise the superior and inferior retinacular vessels. The anterior and posterior vessels are of less importance; these arteries form Hunter’s arterial circle. There are between four and six superior retinacular vessels that penetrate the head at the superomedial and terminal part of the neck, and form the cervical branches, the superior metaphyseal and lateral epiphyseal arteries, of which the later is the main artery, feeding 70%–80% of the femoral head. It runs along the old growth plate, anastomosing with the ligament teres vessels. The ligament teres artery branches from the obturator artery,, [Figure 1]. Numerous methods are described for the assessment of residual vascularity of femoral head after femoral neck fracture; these methods are provided to be beneficial for the assessment of post-traumatic osteonecrosis risk. Invasive methods are superselective angiography (SSA), intraosseous oxygen pressure measurement, and Doppler-laser hemodynamic measurement, whereas other noninvasive methods include scintigraphy and classical or dynamic magnetic resonance imaging (MRI). SSA analyzes extraosseous arterial structures and was first used, in 1977, by Théron. According to his research, the femoral head vascularity can be assessed only by catheterizing the medial circumflex artery; by catheterizing it, we can opacify the superior capsular vessels. Another study by Heuck et al. showed vascular changes in 97% cases of osteonecrosis and confirmed that vascular lesion is the main offending factor for osteonecrosis. In another study by Langer et al., digital subtraction angiography was applied in nine patients presenting with recent femoral neck fracture and found eight interruptions or complete thromboses of superior nutrient branches originating in the medial circumflex artery. And hence, according to them, there is a correlation between superior medial circumflex artery branch involvement and risk of osteonecrosis. Thus, they recommended this technique for the assessment of osteonecrosis risk. Angiography is a good modality for the assessment of vascular lesion and underlying risk of osteonecrosis but with certain drawbacks such as its invasive nature; risk of complications such as arterial dissection, thrombosis, and hematoma; and expertise required to perform such a specialized examination. Vascular lesions are seen at the time of fracture and one can confirm these lesions in confirmed necrosis. Another invasive method for the assessment of residual vascularity is intraosseous oxygen pressure measurement. This novel technique is based on the study by Kiaer et al. They had shown reduced oxygen pressure in subchondral bone in confirmed necrosis of femoral head. Watanabe et al. had measured the intraosseous oxygen pressure in femoral head after femoral neck fracture. For measurement following fracture, they had surgically implanted subchondral polarographic electrode. Their aim was to assess the subchondral ischemia and the risk of post-traumatic necrosis of femoral head. Intraoperatively, the electrode was directly implanted at two points in the femoral head, and measurement of intraosseous oxygen pressure was recorded. In their study, they had included total 17 patients. On follow-up, MRI was used. A correlation was found between necrosis (seven cases) and oxygen pressure values at the two points. Difference of more than 3mm Hg in intraosseous oxygen pressure between the two points is considered as a risk of necrosis of femoral head., This is a novel method for assessing the risk of post-traumatic necrosis of femoral head, but the major drawback is that it is an invasive method, electrodes are placed preoperatively, and expertise is required to record the measurement. Doppler laser measures the blood flow through the introducer implanted. For femoral blood flow assessment, it was first used by Swiontkowski et al. They had confirmed the osteonecrosis of femoral head by comparing the flow in osteonecrotic area with that in the healthy trochanteric region. Later on, this method was used by Sugamoto et al. They correlated the results with the fracture displacement on the Garden scale: flow was elevated and sinusoidal in Garden I, II, and in certain cases III, but flow was low and non-sinusoidal in other cases of Garden III and all of Garden IV. This is again a good technique, but invasiveness, instrumentation, and expertise are the major drawbacks. Bone scintigraphy is more sensitive and gives earlier results than computed tomography, analyzing vascular perfusion and bone marrow uptake on images taken during and after radiotracer injection. It gives hemodynamic information in vascular phase and metabolic information in osseous phase. The vascular changes precede onset of the necrotic process. Tucker introduced the use of a radioactive tracer in the diagnosis of femoral osteonecrosis in 1950. Using phosphorus 32 (32P), the trochanter/head intensity ratio was measured preoperatively on a Geiger counter. Riggins et al. had used scintigraphy for the diagnosis of femoral head necrosis. Webber et al. and Meyers et al. had used technetium 99m bone scintigraphy for the assessment of residual vascularity of femoral head after femoral neck fracture. This isotope was chosen as being specific to tissue vascularity disturbance in general and of bone in particular, being phagocyted by bone marrow reticulocytes. Meyers et al. included 95 femoral neck fractures in their prospective series. They reported about 95% accuracy in the estimation of necrosis risk at 2 years’ follow-up. According to them, this technique is easy and relatively risk free. They had recommended scintigraphy early within the first 24h of fracture to assess necrosis risk and to guide treatment. In a similar study by Philipps et al. including 30 femoral neck fractures, 90% accuracy was reported in estimation of necrosis risk. They had performed scintigraphy within 72h. D’Ambrosia et al. used technetium 99m diphosphonate to diagnose necrosis. According to them, technetium 99 diphosphonate shows good sensitivity in diagnosing osteonecrosis compared to standard X-ray. Lucie et al. included 92 recent femoral neck fractures in their study. They had used technetium 99m phosphate scintigraphy and found accuracy was 91% in the “normal scintigraphy” group and 82% in the “pathologic scintigraphy” group. Turner also used technetium 99m antimony colloid scintigraphy in an experimental and clinical study in the first 24h after neck fracture in 30 patients; 16 fractures were normal and 14 were pathological; 13 of the latter developed necrosis within 2 years; and accuracy was found to be 87%. So according to the present literature available, scintigraphy provides reliable information. It can pick up signs of osteonecrosis prior to appearance of radiological signs. It is also more accessible and cheaper, but with the iatrogenic risks that, however rare, are inherent to the use of isotopes. MRI plays a pivotal role in the diagnosis of avascular necrosis of the femoral head. There are many studies showing the superiority of MRI over other modalities in diagnosis of post-traumatic osteonecrosis of femoral head. According to the article by Lang et al., 90%–100% sensitivity and 100% specificity was shown by MRI. MRI provided earlier diagnosis than scintigraphy as shown by Basset et al. According to Speer et al., a minimum interval of 48h is required to detect signs of osteonecrosis on MRI. They had conducted study in 15 femoral neck fractures. In another study conducted by Asnis et al., MRI was found to detect osteonecrosis as of 2 weeks. Their series included 28 patients analyzed on radiology. Another study conducted by Kawasaki et al. included 31 patients with femoral neck fractures and followed them for 12 months, by performing MRI at 2, 6, and 12 months. They concluded that a 6-month interval provided the best sensitivity, specificity, and accuracy in diagnosing post-traumatic osteonecrosis. Interest then shifted to dynamic MRI with contrast medium injection. Kamano et al. included 29 patients with femoral neck fractures. They had conducted dynamic MRI within 24h of fracture. They classified the results according to the levels of enhancement in head: type 1 = no enhancement, type 2 = partial enhancement, and type 3 = complete enhancement. On follow-up MRI, there was 100% necrosis in type 1, 50% in type 2, and none in type 3. The authors concluded that this dynamic MRI technique is very reliable, with the advantage of being noninvasive. Another study by Konishiike et al. confirmed these finding. In their series of 22 fractures, dynamic MRI was performed within 48h of fracture. They distinguished three types of results, comparing enhancement curves between the fractured and healthy sides: type A = identical curves, type C = flat fracture-side curve, and type B = intermediate fracture-side aspect. Type B curves were interpreted as an intermediate hemodynamic state not systematically requiring arthroplasty. The authors concluded that their new MRI classification could guide indications for surgery: in their current practice, conservative treatment is indicated in case of type A or B curves. Kubo et al. reported identical results using color mapping (red = normal perfusion; black = no perfusion) on dynamic images. Three types were distinguished: type A = red, identical to the healthy side; type B = intermediate; and type C = black, with total absence of perfusion. This classification is of immediate impact on the choice of treatment. Thus, dynamic MRI is useful in assessing the vascularity and predicting the prognosis after femoral neck fracture. Nowadays it is readily available and is noninvasive. There are many methods for the assessment of residual vascularity of femoral head after femoral neck fractures. Invasive methods such as superselective angiography, intraosseous oxygen pressure measurement, and Doppler-laser hemodynamic measurement are reliable for assessment but need invasion and expertise for assessment, and some complications are related to it due to invasion. Noninvasive methods such as scintigraphy and dynamic MRI are found to give promising results for assessment. The future seems to lie with dynamic MRI, which gives new classification of femoral neck fractures, based on a noninvasive assessment of femoral head vascularity. Asnis SE, Wanek-Sgaglione L, Manhasset P. Intracapsular fractures of the femoral neck. Results of cannulated screw fixation. J Bone Joint Surg Am 1994;1:1793-803. Gomez-Castresana FB, Caballer AP, Portal LF. Avascular necrosis of femoral head after femoral neck fracture. Clin Orthop 2002;1:87-109. Swiontkowski M, Tepic P, Rahn B, Perren S. The effect of femoral neck fracture on femoral head blood flow. In: Bone Circulation and Bone Necrosis. Fourth Symposium on Bone Circulation. New York: Springer-Verlag; 1990: 150-3. Smith F. Effects of rotatory and valgus malpositions on blood supply to the femoral head. J Bone Joint Surg Am 1959;1:800-15. Trueta J, Harrison MH. The normal vascular anatomy of the femoral head in adult man. J Bone Joint Surg Br 1953;1:442-61. Gautier E, Ganz K, Krügel N, Gill T, Ganz R. Anatomy of the medial circumflex artery and its surgical implications. J Bone Joint Surg Br 2000;1:679-83. Hunter W. Of the structure and diseases of articulating cartilages. Philos Trans R Soc of Lond 1743;1:514-20. Ehlingera M, Moser T, Adam P, Bierry G, Gangi A, de Mathelin M, et al. Early prediction of femoral head avascular necrosis following neck fracture. Orthop Traumatol Surg Res 2011;1:79-88. Théron J. Superselective angiography of the hip. Technique, normal features, and early results in idiopathic necrosis of the femoral head. Radiology 1977;1:649-57. Heuck A, Reiser M, Schumacher F, Lehner K, Gmeinwieser J, Kahn T, et al. Selective digital subtraction arteriography in necrosis of the femoral head. Skeletal Radiol 1987;1:270-4. Langer R, Langer M, Scholz A, Astinet F, Schwetlick G, Felix R. Femoral head perfusion in patients with femoral neck fracture and femoral head necrosis. J Belge Radiol 1993;1:145-9. Kiaer T, Pedersen NW, Kristensen KD, Starklint H. Intra-osseous pressure and oxygen tension in avascular necrosis and osteoarthritis of the hip. J Bone Joint Surg Br 1990;1:1023-30. Watanabe Y, Terashima Y, Takenaka N, Kobayashi M, Matsushita T. Prediction of avascular necrosis of the femoral head by measuring intramedullary oxygen tension after femoral neck fracture. J Orthop Trauma 2007;1:456-61. Swiontkowski MF, Ganz R, Schlegel U, Perren SM. Laser Doppler flowmetry for clinical evaluation of femoral head osteonecrosis. Clin Orthop 1;1:181-5. Sugamoto K, Ochi T, Takahashi Y, Tamura T, Matsuoka T. Hemodynamic measurement in the femoral head using laser Doppler. Clin Orthop 1998;1:138-47. Tucker FR. The use of radioactive phosphorus in the diagnosis of avascular necrosis of the femoral head. J Bone Joint Surg Br 1950;1:100-4. Riggins RS, DeNardo GL, D’Ambrosia R, Goldman M. Assessment of circulation in the femoral head by 18F scintigraphy. J Nucl Med 1974;1:183-6. Webber MM, Wagner J, Cragin MD, Victery W. Femoral head blood supply demonstrated by radiotracers. J Nucl Med 1974;1:543. Meyers MH, Telfer N, Moore TM. Determination of the vascularity of the femoral head with technetium 99m-sulphur-colloid. J Bone Joint Surg Am 1977;1:658-64. Philipps TW, Aitken GK, McKenzie RA. Sulphur colloid bone scan assessment of femoral head vascularity following subcapital fracture of the hip. Clin Orthop 1986;1:52-4. D’Ambrosia RD, Shoji H, Riggins RS, Stadalnik RC, DeNardo GL. Scintigraphy in the diagnosis of osteonecrosis. Clin Orthop 1978;1:139-43. Lucie RS, Fuller S, Burdick DC, Johnston RM. Early prediction of avascular necrosis of the femoral head following femoral neck fractures. Clin Orthop 1981;1:207-14. Turner JH. Post-traumatic avascular necrosis of the femoral head predicted by preoperative technetium 99m antimony colloid scan. An experimental and clinical study. J Bone Joint Surg Am 1983;1:786-96. Lang P, Jegersen HE, Genant HK. Magnetic resonance imaging of the ischemic femoral head in pigs. Clin Orthop 1989;1: 272-80. Basset LW, Gold RH, Reicher M, Bennett LR, Tooke SM. Magnetic resonance imaging in the early diagnosis of ischemic necrosis of the femoral head. Preliminary report. Clin Orthop 1987;1: 237-48. Speer KP, Spritzer CE, Harrelson JM, James AN. Magnetic resonance imaging of the femoral head after acute intracapsular fracture of the femoral neck. J Bone Joint Surg Am 1990;1: 98-103. Asnis SE, Guld ES, Bansal M, Rizzo PF, Bullogh PG. Magnetic resonance imaging of the hip after displaced femoral neck fractures. Clin Orthop 1994;1:191-8. Kawasaki M, Hasegawa Y, Skano S, Sugiyama H, Tajima T, Iwasada S, et al. Prediction of osteonecrosis by magnetic resonance imaging after femoral neck fractures. Clin Orthop 2001;1:157-64. Kamano M, Narita S, Honda Y, Fukushima K, Yamano Y. Contrast enhanced magnetic resonance imaging for femoral neck fracture. Clin Orthop 1998;1:179-86. Konishiike T, Makihata E, Tago H, Sato T, Inoue H. Acute fracture of the neck of the femur. An assessment of perfusion of the head by dynamic MRI. J Bone Joint Surg Br 1999;1:596-9. Kubo T, Nagamachi A, Suganuma K, Endo T. Dynamic MRI positive enhancement integral color mapping in femoral neck fractures. A paper presented at the 75th Annual meeting of American Academy of Orthopaedic Surgeons, San Francisco, California, March 5–9, 2008.